I must say, this is a very stunning Franck Muller Curvex 18k. gold watch when seen on a ladie’s wrist! The heavy 18k. 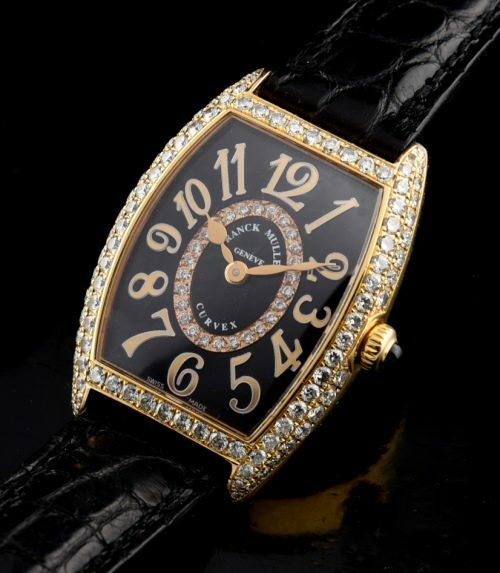 yellow gold case with brilliant diamonds measures 25x35mm., which is a fair sized watch and NOT small. The black dial, having exaggerated Deco style numerals and oval diamond frame really is amazing to gaze upon. The Ronda quartz original movement (of course) is accurate. The original band and 18k. gold buckle is present. The box and papers have been discarded by the original owner. I really have to say, this watch is truly eye-catching and really “pops” on the wrist.